PowerPoint presentation is an interactive and rich medium to share information with lot of people. During a presenstation you may want to point attention to specific content on Powerpoint slide – how about using a laser pointer? Instead of using seperate laser pointing device you can convert your mouse pointer into laser pointer with quick shortcut hotkey. 1. 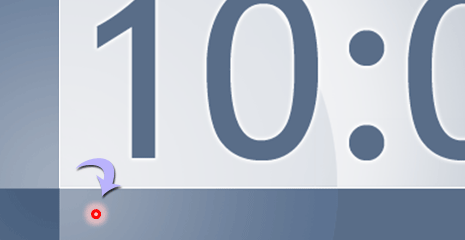 Open PowerPoint presentation slideshow in PowerPoint (2010) application. 2. Press F5 key to run the slideshow. Alternatively, you can click ‘slideshow’ tab and then click ‘from beginning’ button to start the slideshow. 3. During slideshow press & hold Ctrl key and then left click mouse button to make laser pointer appear on the slide. You can move the laser pointer around the slideshow and it will remain visible till you keep the Ctrl key pressed along with left mouse button. You can easily change the color of Laser pointer displayed using above procedure in Microsoft PowerPoint application. 1. In PowerPoint application, click ‘slideshow’ tab. 2. Then click ‘setup slideshow’ button to open settings dialog box. 3. 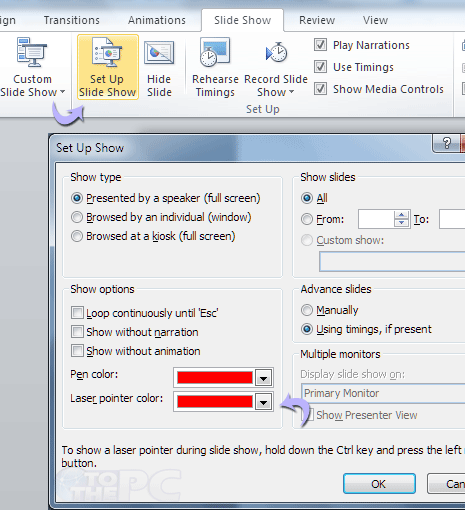 Click drop down box next to ‘Laser pointer color’ to change the color of laser pointer in PowerPoint.